Discover the secret behind incredibly tight vocal arrangements. Do you want perfectly aligned vocals? Then get VocALign! It's that simple. Extraordinarily tight alignment. A huge time saver. Much better results than manual editing. It's a very specialist plug-in. Can be fiddly on complex arrangements. 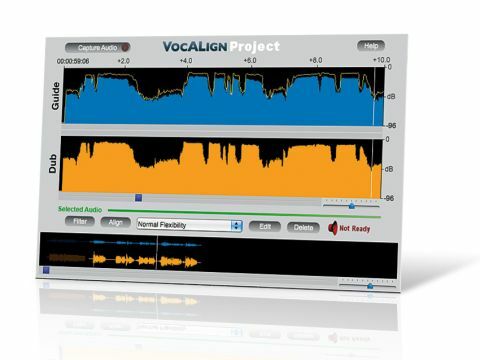 Originally developed for f­ilm audio post-production work, VocALign has been in circulation as a plug-in and standalone program for about 15 years now, and it revolutionised the way dubbed dialogue is aligned to the original recorded speech. It freed the actor from trying hard to lip-sync, enabling them to focus on expression, safe in the knowledge that VocALign would tighten words to the action afterwards. Application in the music world was clear: double tracks, backing vocals and harmonies could be aligned to the lead vocal to create a very tight group, clearing up those annoying ­flutters from multiple 'ess' sounds, for example. Now, with VocALign Project 3, it's also available in VST3 format, for use with Cubase and Nuendo. What VocALign actually does is a simple trick that, as any audio professional will tell you, it is very adept at, and it can save hours - if not days - of tedious manual work. The old-school alternative is to either do take after take until the vocal timing is tight, or to laboriously edit the backing vocal tracks, cutting up words and stretching single consonants into time with the lead, or more likely a lot of both. VocALign takes two audio signals: the guide, which in most cases is the lead vocal, and the dub, which is the backing vocal or harmony that you want to lock to it. It analyses the energy prof­iles over time of both signals and stretches and compresses the dub track to precisely follow the prof­ile of the guide. You can ref­ine the start and end points of the section you want to align to avoid it getting confused by extraneous noises/words and audition the results before committing to a fresh 'VocALigned' track. So how exactly does VocALign work in Cubase? As we said, VocALign needs two signals to work its magic: the guide signal, which provides the template to which the second dub signal is aligned. To achieve this, a VocALign instance is inserted on the dub channel. From the guide channel, an auxiliary send is routed to VocALign's VST3-enabled sidechain input. You'd then play the section to be aligned with the Capture Audio button engaged. When the transport is stopped, the two waveforms will appear in their respective windows and after hitting Edit, a visual representation of the alignment is traced over the guide. Play the section again to hear the resultant aligned track instead of the original. If needs be, you can ref­ine the section to be aligned using the start and end arrows. Once you're happy, you can bounce the aligned dub signal onto a fresh track using Cubase's mixdown functions. It performs the alignment process in seconds and the results are astonishingly good. Compare this to the hours it can take to edit parts into line by hand - even then, the results are often a tad out of focus! If time is money, you would recoup your investment in a matter of weeks. VocALign doesn't always get it right, and you occasionally have to do a bit of ref­inement either to the length of the target section or the content of what you're aligning, but it happily manages four or even eight-bar phrases in one go. The process of aligning multiple backing vocals is simply a matter of keeping the lead vocal guide track intact and feeding each dub track for that section one by one. Vocals aren't the only thing it works on. Anything that's doubled and needs to be aligned is a candidate, such as guitars, strings and more. And it's also ripe for abuse too, aligning completely di­fferent audio signals with every possibility of happy accidents amid the chaos. To sum up, VocALign may seem like an expensive one-trick pony, but what a trick it is! If you're a rap producer and crave punchy Dre doubles, or if you're big on vocal arrangements and want the power and focus of a tight vocal section, here's the perfect solution.